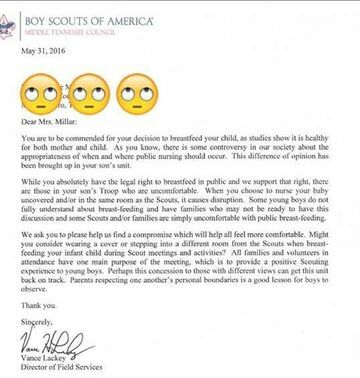 This Breastfeeding Mama Just Got Shamed by a Bunch of Boy Scouts! Read the infuriating letter they wrote her! Jasmine Millar was at her son's Boy Scout meeting with her other two kids in tow when it was time for her 1-year-old to eat. So she started nursing the little guy in the back of the room, using an extra shirt to cover her breast. "I was using the two-shirt method which covers the top and bottom of the breast," she explains in a post on Breastfeeding Mama Talk. "The meeting was coming to a close and they had a birthday party after, so they were having snacks. I was in the back at a table with my toddler that was participating in snacks and my nurser. He was tired and hungry and was pulling at me to nurse, so I did." Hey, we've all been there, right? And at first, everything seemed fine—until Millar was later pulled aside by a female scout leader and told several times that she was being "inappropriate." "I was also told that other parents would be upset with me," she recalls. "I was told I needed to leave or cover completely with a blanket from now on. This was our 3rd troop and the first time anyone has ever had issues with me breastfeeding. I was so shocked and embarrassed. I felt outnumbered and bullied. I ended up leaving in tears and continued to cry the remainder of the night." "I couldn't believe what I had just read," Millar explains. 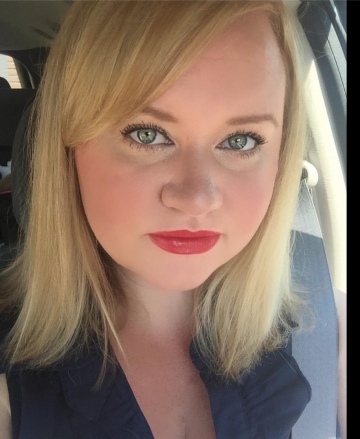 "Did they really just side with the very same people who shamed me? I was dumbfounded because they are aware of what the law states and that it's my right to breastfeed my child. They say 'compromise' but really what they are saying is, 'Breastfeed your child, but do so in hiding because no one wants to see it.'" She's not wrong. But the internet remains divided on the issue—and while many commenters have come out in full support of Millar, just as many maintain that they wouldn't be happy with a mom breastfeeding partially uncovered in front of their kids, if they weren't around to explain to them what they were seeing. Regardless of what you believe, it's pretty disappointing that the organization didn't use the opportunity to school the leaders, the boys and anyone else who had a problem with Millar's breastfeeding, that she was within her legal rights to feed her child however she sees fit. Instead, they took the easy way out and went the mom-shaming route, sending out a passive aggressive letter that only made her feel worse. A pretty bad example for the kids regarding tolerance, don't you think?